Tarra-Bulga National Park: A Work in Progress. Renowned for its stunning cool-temperate rainforest, luxuriant tree-ferns and towering Mountain Ash trees, Tarra-Bulga National Park is cherished by Gippslanders and enjoyed by visitors from all over the world. The original separate small, but significant, Bulga and Tarra Valley Parks were reserved just over a century ago while the giant forests surrounding them were being laboriously hand cleared by selectors to turn into farms. Clearing this land turned out to be folly, the terrain, cold winters, bushfires, weeds and rabbits all contributed to the farmers giving up and walking away, leaving scrub and noxious weeds in their wake. Forestry and sawmilling in the area for timber and pulpwood also led to the loss of more of the original giant trees. In recent years Tarra-Bulga National Park has expanded. New areas including abandoned farmland have been added with the goal of physically linking Tarra Valley and Bulga Parks as well as to reduce visitor pressure on significant sites, provide greater recreational opportunities and protect additional vegetation communities representative of the Strzelecki Ranges. It is recognised that Tarra-Bulga National Park has the potential to become even more spectacular and significant as cleared land is successfully regenerated. To this end the Friends of Tarra-Bulga National Park are seeking volunteers interested in helping with the regeneration process. The group holds occasional work days on weekends, undertaking activities such as planting over-storey trees and controlling noxious weeds. The next activity is scheduled for Saturday July the 23rd 30th and will focus on removing tree guards from successful new plantings. The meeting point will be at 9.30am at the Visitors Centre Car Park. 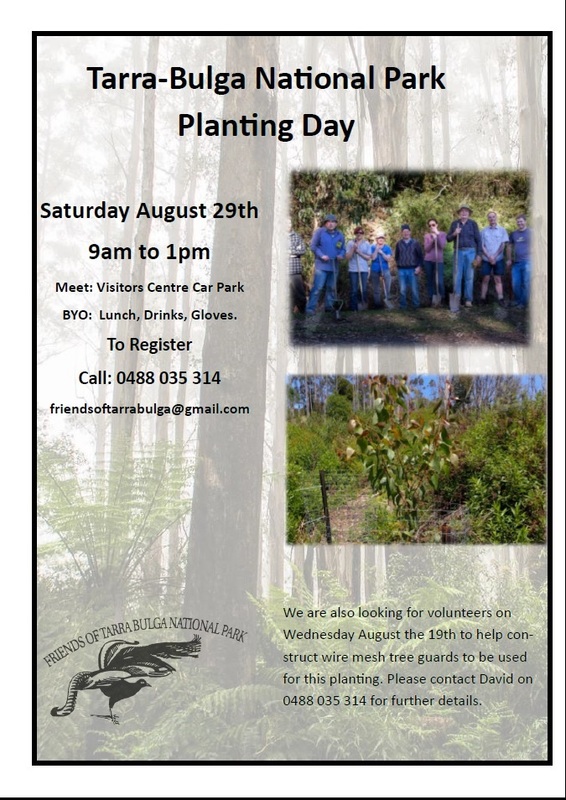 For further details or to register your interest in helping out Friends of Tarra-Bulga with any of their activities email friendsoftarrabulga@gmail.com or phone 0488 035 314. Friends of Tarra-Bulga National Park have a number of project sites where they are aiming to convert several not so pristine areas of the park back to towering Mountain Ash Forest. On Saturday August the 9th they are holding a planting day along Diaper Tk where they’ve been restoring a 2ha site that was once over-run by 30m high Sycamore Maple trees. The friends are keen for as many helpers are possible on the day but please note the task is a bit of a challenge and may not be for everyone. Access to the site is via 2.5km walk, which will probably be quite muddy at this time of year. Movement around the planting site itself is difficult, as it is covered in re-generating shrubs, ferns, logs and branches of what remains of the dead Sycamore Maple trees; there may also be the odd Leech. In order to keep the newly planted Mountain Ash seedlings out of reach of hungry Swamp Wallabies, large wire mesh tree guards will be installed on the day. So if all of the warnings found above hasn’t deterred you and you are keen to come along and plant a tree that may one day be an 80m tall giant please come along. The meeting spot will be at the Tarra-Bulga National Park visitors centre car park (Balook) at 9am. Merry Christmas to all. This site will become bigger and better now as this site will now become Friends of Tarra Bulga National Parks main website, Our VicNet site will be disappearing soon and the information on that such as Newsletters, Walk Information, Park History etc will all be transferred over to here. Also note the new domain name which is already in operation friendsoftarrabulga.org.au It should make our site nice and easy to find. We also have a new email address friendsoftarrabulga@gmail.com which will be the one for people who want to get in touch with us to contact. Our long serving President Peter is off on an overseas experience for a year so all inquires about the group should now go to David Akers who can be contacted on 0488 035 314.